I’m not sure when it happened, though, upon reflection, it was some cold and crisp day in 2014 when ‘the Cloud’ became God. And it has. We’re almost a quarter into 2016 and at the time of this writing, the cloud has ceased to be some abstract metaphysical entity, but rather a complete behemoth of a business structure that serves the business world with much benefit. Well, we all can benefit from the cloud idea, but it is enterprising minds who had the cash to splash on setting up cloud systems, and did, that have benefitted most, and their systems just keep rapidly developing – that’s big business for you. The growth and development in the consumer realm have been much different. Sure we all read about it every day, and probably spit the word now and then, but on a whole, consumer adoption of cloud services is relatively small. Now, before some of you balk at this, allow me to explain. I understand that companies like Dropbox and Apple who both offer Public Cloud services have had millions of subscribers for years now, but the fact is that even with those subscribers, the amount of content in clouds is actually small, something around 10-15% last I heard. If we consider why this is so, most reading this, being tech savvy, will probably arrive at the matter of cost, and perhaps for the paranoid among us, security. That’s hard to refute, but I have faith in the unrelenting power of human laziness, and that leads me to believe we’ll pay a lot for convenience, which means it wouldn’t be a stretch to think that cloud systems haven’t taken off largely due to complexity and other convenience factors. Personal Cloud services, ones built for and by an individual, I believe, is what many of us want, but we’ve been swayed by complexity and cost. In order to tackle that, Lima has arisen, and upon your requests for review, I got one and here’s where it stands. Lima is, at its core, a dumbed down NAS system, and that’s not a bad thing. Essentially it’s a small device that plugs into your router, then into one or more USB connected external drives, and then all the information on those drives becomes available for use through the Lima apps, which work on Windows and Apple desktop OS systems, as well as Android and iOS mobile systems. That’s it in a nutshell. To the more tech-minded, you’re no doubt thinking why or how this is in any way different from a regular NAS system, and it’s different really because of the software. The app is designed to reflect all updates on all devices with the app installed, and the app is also its own media player and viewer. What Lima has tried to do is take what is more a technical type of endeavor and make it user-friendly. It may not be re-inventing the wheel, but there’s a lot to be said for creating something with an ease of use. Lima is allowing you to hook-up a drive or multiple drives (though I haven’t tried that), drag and drop files into a special Lima network folder, and then lets you enjoy those files anywhere without the need to go through an external server. The App on iOS is intuitive and nice to look at; the music player shows the album art which is great, though it doesn’t let you use playlists just yet; documents like PDFs have so far been read with no difficulty; images sync quickly and can be viewed and zoomed in on etcetera, and you can export them to other apps, and videos play fine once you play them from the start. So far I haven’t been able to scrub as I’d like without it faltering. But you can do all of this from anywhere using 3G/LTE or WiFi. You just hook up your drive at home, leave it be, and get on with it. That’s nice because you can choose a massive dive, and even an SSD if you’d like and then you don’t have to worry about storage on your devices. And should you add a file from mobile or other device, it will simply be added to the drive back home, so all devices stay in sync. 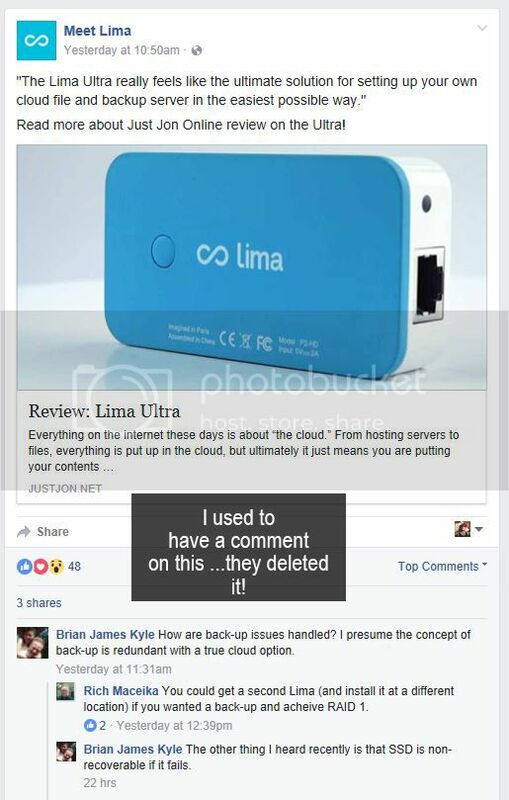 That’s the essence of what Lima allows you to do, and thus, the applications for photographers can seem rather obvious: You can store your entire photo library, catalogs, whatever, on an external, leave it at home forever connected to your router, and then you’ll be able to access it anywhere. This includes your raw files which you can download on another computer if need be. And of course, you can, should you want to, save any file onto your mobile device much like you would with Spotify. *Thus far I have been unable to actually view the raw files on my iPhone, but they download just fine on a desktop or laptop. Tiff files load, but don’t seem to appear correctly. However, I would assume this is more an issue of color space and the device, rather than any fault of Lima’s. Lima is coming from Kickstarter, albeit a very highly funded one and then the company went on to get millions in VC due to high interest, high demand, and I would assume great salesmanship. This lead to a lot of frustration on the part of backers because it delayed the delivery not by a few months but a year or so. The CEO, Severin Marcombes, suggested that given the amount of interest, the number of units they would have to produce would have to increase dramatically and that he wanted to make sure they had the fit-and-finish of a store-shelf product, versus a half-way-point Kickstarter gadget. On the material end of that, he and the team delivered, as the product packaging is sleek, the product itself looks and feels like it’s been manufactured with proper quality control, and it’s just attractive. The problem, however, is that what really separates this from other NAS systems is the software, and that, is more of a rough uncut stone than a polished gem. One immediate annoyance is that you must have an empty drive to set-up, which means you have to either clear a drive or get a new one. It’s not the end of the world, but, we’d prefer it otherwise. I tried connecting 3 various drives including a small Samsung T1 and had no issues with recognition at all, which was great, though I didn’t see much of a difference in operating speed between the SSD and the HDD varieties; I didn’t measure, but in terms of perceived difference, it was either not there or negligible. And while transfer speeds are relatively good, they are deceiving. If you’re ready to drop a few GBs of video or imagery into a folder, they will be done in a few seconds, and a few seconds later they’ll show up on all devices. However, it appears they aren’t always immediately accessible. Clicking on them will sometimes result in nothing loading, or you’re told you’re not connected, or they aren’t on ‘Lima’ as a device. This is odd given that Lima doesn’t actually store anything. This is probably my biggest qualm with Lima, that retrieval speeds of files on mobile aren’t good for newly uploaded files – it’s just not dependable that way, not yet. I say not yet as it seems Lima is a company aiming for the stars and just not quite able to get there yet, because there seems to be a lot of work coming in the pipeline, and I believe, this being software based could mean Lima just continues to improve. If and when it does, and it fully delivers on its promises, I think it’s going to be brilliant for a lot of people. I will say here that if you get Lima, there are some operating procedures you need to know so READ the manual first. It’s short so just read it and save any trouble. Some of these kinks, which require reading about, will hopefully be sorted out in the next iteration of the software. It’s pretty to look at physically and in-app, and I don’t think anyone would say otherwise. If you own any type of modern computer or device, this will likely just fit right in, or at least, it won’t stand out. But then again it wouldn’t matter, because this is going to sit right beside your router, likely, so no one is really going to be seeing it much. Also, it comes with a very short ethernet cable with which to connect to the router – some will complain it’s too short, and others will see it as a clutter saver. You should also be aware that it does need to be powered on its own, so it comes with a little wall plug which, is a bit annoying, though likely necessary. But outlets near routers are usually packed, and now you’ve got to find another empty one. As alluded to above, the app design is efficient, slick, and honestly, little to complain about. It seems to handle large movie files just fine and in just about any file type, say if you want to watch your favorite lighting tutorial when you’re killing time, or to check something while on the job – though it needs to sort out the scrubbing issue. These earphones represent the new world your’e about to step into. it doesn’t matter which device you use them with. They will always play your entire music collection. What? Or, it’s French so, ‘Qu’est-ce que…?’ This would have you think they are aiming this strictly for music lovers to transport their media, and it still doesn’t make sense. It sort of leads me to assume it was thought of sensibly in French and just didn’t translate well due to some rural colloquial nuance. Other than that, design is mighty fine. Well, the build quality feels sturdy, and you won’t have fear that dropping it will see it destroyed; all the female plug outlets have a satisfying snugness to them, which is right up my alley. On the bottom, you’ll see it’s been imagined in Paris and assembled in China, which, up until recently I would’ve viewed as a marker for something pretty that falls apart quickly, but France has been pushing out some really clever devices lately. DxO One anyone? This may be the hardest sell because coming in at $99, it’s not exactly cheap. You can certainly get similar types of devices that do NAS operations for less or that do them really well and more robustly for a little bit more. But again, I have to stress that this is a software piece really. The device is neither here nor there, but the software and how it integrates is its real feature, and the familiarity it will bring to non-overly technical users will be hugely appealing. What they will see is sort of akin to what an iOS allows for – it allows a superficial and easy to use app for navigation of a distinctly complex process underneath. That in itself is likely worth it. I use mine now to keep copies of my entire collection of images and LRCAT files, just in case, I would ever need them elsewhere and don’t have a hard copy. Typically, I will travel around with my Samsung T1 with current files but should that get lost or damaged, this is a great back-up, and, of course, there’s no recurring fee to contend with which is brilliant. For this purpose, it’s great. If you have the time, and the inclination towards some sort of toned down NAS system, this I would recommend. I say time because I don’t think it’s quite flawless yet, but get the feeling you could just get it now, play with it, use it as you can, resting assured that the software updates to come will continually improve the functionality. Nicolas responded that shipping could take up to 3 weeks and I needed to be patient. 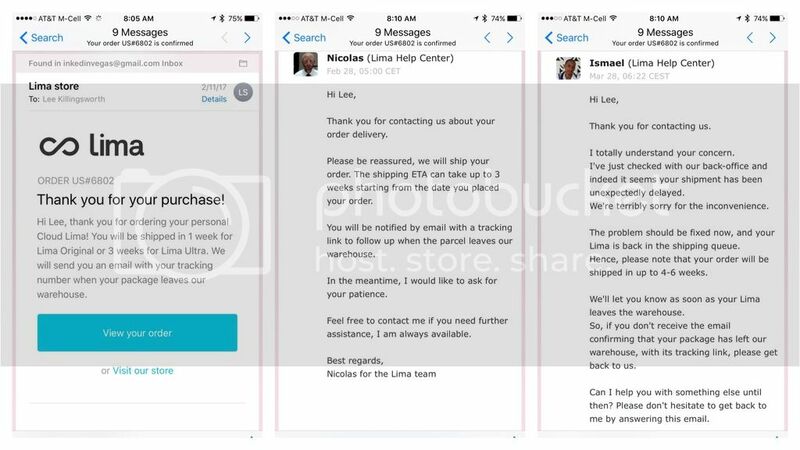 on March 27th, a full month and a half after ordering, I sent another email asking what the hold up is?Ismael responds saying my order was lost by them (but not my money) and they have reinserted my order back into the cue (with the people that ordered their products that same day, not back in feb like me) and I should have my order shipped in the next 4-6 weeks?! WOW..if there was a book on how NOT TO HANDLE customer issues, this would be the key example. Man, what an epic fail Meet Lima You have now turned this from a mess up on your part logistically and compounded it by the utter failure of handing this issue after the fact. A customer shouldn’t have to wait till mid may for a product I ordered mid feb. 3 months for delivery??? fail. Shame on you Meet Lima #fail fail so hard. I have been using Lima for 3 months now, and have even worked with a low bandwidth and my LIMA system at home. Working on my lightroom and photoshop files directly from starbucks or McDonalds WIFI which to be honest are pretty poor at the best of times due to amount of people surfing on them. I admit that saving takes longer, and opening too, but the comfort of being able to know that my files are at home, on my Harddrive was a treat in itself. Even though i had to purchase a new one, 3To for 100$ on a standard drive is seriously not much nowadays in comparison with a QNAP, Synology or other NAS. For the story, 1 month before deciding to go on Lima, i found myself wanting to edit a friday night, i had a delivery to make for the end of the week-end. My home at the time was 2 hours away from my week base & office. I get home, put the kids to bed, and go to my desk, take out computer, cables… hard drive… no… forget the harddrive… i had forgotten it in the office. Here i go at 10pm, drive 4 hours to get that drive and start working on some files. The 100$ of HardDrive+ 100$ of the lima were paid for in time, and fuel had i purchased it prior to that event. The most important thing to make the lima efficient is to really work your Router and Switch correctly. You must open the correct Ports, enable the various necessary options, UPnP, static port for the Lima etc. If you fail to do so, your Lima system will be slow, veeeeerrry slow… But if you do it properly and that in your lima panel the drive is listed as “connected” and not “connected through gateway”, it will seriously work fine once files are on the drive. Consider it as a safety net, and a nice add-on if you have an issue with your computer, files etc when far away and i’m sure you will be happy with it.